ISIS releases new recording of Abu Bakr al-Baghdadi for the first time since last September. Islamic State (ISIS) jihadist group leader Abu Bakr al-Baghdadi called on Muslims to wage "jihad" in a purported new audio recording released on Wednesday, according to AFP. The Telegram message on the occasion of the Muslim holiday of Eid al-Adha is the first known to be released since another was broadcast in September last year, and comes as ISIS has lost most of its territory in Iraq and Syria. "Those who forget their religion, patience, jihad against their enemies, and their certainty in the creator's promise lose and are disgraced," the leader said in the recording. "But when they hold on to it, they are mighty and victorious, even if after a certain time," he added. 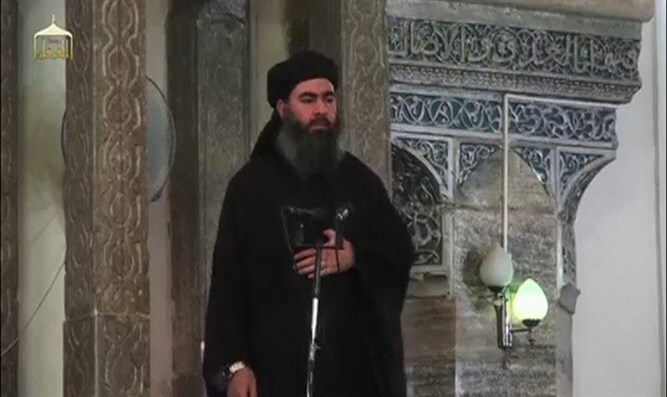 There have been conflicting reports about Baghdadi’s fate in recent years. In February it was reported that he was still alive, but that injury and poor health had forced him to relinquish control of the terror group. The Russian Defense Ministry said several months ago that the ISIS leader might have been among a group of ISIS members who were killed in a Russian air strike south of Raqqa, ISIS's de facto capital in Syria. The Syrian Observatory for Human Rights subsequently claimed it had "confirmed information" that Baghdadi has been killed, citing high-level ISIS commanders. U.S. officials, however, have remained skeptical. U.S. Defense Secretary Jim Mattis said in late July he assumes that Baghdadi is still alive. ISIS overran large swathes of Syria and neighboring Iraq in 2014, proclaiming a "caliphate" in areas they controlled. The jihadists have since lost most of that area to various offensives in both countries. A UN report released last week estimated that between 20,000 and 30,000 ISIS fighters remain in Iraq and Syria despite the jihadist group's defeat.